I mentioned a couple of weeks ago that I was toying with starting a one-name study for my Robledo surname. Primarily because I am hoping it might help me finally make some progress on this total brick wall surname, but also because I don’t find a lot of other people researching this surname. In the one-name study session she taught at RootsTech last month, Tessa Keough(@TessaKeough), showed us examples of tracing a surname through the U.S. Censuses to identify when a particular surname first makes an appearance in those records, and to identify patterns of migration. She recommended it as a good place to start such a study, and to use both Ancestry.com and FamlySearch.org for comparison and better accuracy. My study focuses solely on the Robledo surname; not any of it variances. I decided to initially analyze the federal censuses spanning 1790 to 1850. The 1790 U.S. Census was the first federal census, and the 1850 one was the first federal census following the acquisition of much of the southwest through the Treaty of Guadalupe Hidalgo in 1848 as a result of the Mexican-American War. Since Robledo is a Mexican and Spanish surname, I did not expect to it appear in federal census records until after the treaty, when what are now the southwest states were ceded by Mexico to the United States. 1848, February 2: Treaty of Guadalupe Hidalgo; Mexican Cession. 1850, September 9: California Statehood; New Mexico Territory formed. 1912, January 6: New Mexico Statehood. My hunch was correct. I do not find anyone with the Robledo surname until 1850. Counting individuals enumerated on each U.S. Census. This spreadsheet is from my Ancestry.com analysis, but the FamilySearch analysis had the same exact results. Counting households enumerated on each U.S. Census. This spreadsheet is from my Ancestry.com analysis, but the FamilySearch analysis had the same exact results. Counting males enumerated on each U.S. Census. This spreadsheet is from my Ancestry.com analysis, but the FamilySearch analysis had the same exact results. The regular 1850 U.S. Census is the first federal census on which I find the surname Robledo. I did not find any Robledo listed on the Slave or Mortality Schedules. Transcription of Robledo entries in the 1850 U.S. Census. Source: Ancestry.com. Transcription of Robledo entries in the 1850 U.S. Census. Source: FamilySearch.org. By 1850, there are 11 individuals recorded with the surname Robledo: 6 males and 5 females. These 11 individuals lived in pre-statehood California (enumerated 11 February; 7 months prior to statehood), the newly formed New Mexico Territory (enumerated 17, 27, and 31 December), and of all places…Connecticut. These individuals make up 5 different households: 3 in New Mexico Territory, 1 in California, and 1 in Connecticut. The Jose listed by himself (a servant) in New Mexico Territory is spelled Robledo on both Ancestry and FamilySearch. The Prudencia household in New Mexico Territory is also spelled Robledo on both Ancestry and FamilySearch. The Teodoro household in New Mexico Territory is spelled Robledo on Ancestry, yet Robleco on FamilySearch. 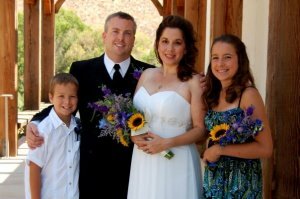 The California household is spelled Roblero on both Ancestry and FamilySearch. The Connecticut individual is spelled Robloda on Ancestry and Roblada on FamilySearch. Looking for these individuals on future censues will hopefully help me determine if these variations are indeed due to enumerator or transcriber error, or if they are distinct and separate surnames…not Robledo. The Connecticut Robledo is definitely an oddity that I may have to investigate further just for curiosity’s sake. I do not think this is the beginning of a Robledo migration trend into Connecticut. This unnamed Robloda or Roblada male does not have a profession identified, but is listed in a large household with a bunch of other people and different surnames. Sadly he is the only person in the household for whom a first name is not provided, which would give me a clue if he had Hispanic origins. I will have to look for him on future censuses. The California household also catches my eye, because California is where my Robledo line settled when they immigrated to the U.S. from Mexico in the 1910s. I have always heard from Dad’s family that our Nieto-Robledo family followed Nieto relations who already lived in California, but I wonder if we also had Robledo relations here as well? I may have to trace this 1850 California Robledo household back to Mexico. I had to play around with the search filter settings on both Ancestry and FamilySearch, casting both broad and more exact nets on the Robledo spelling. For the most part, the results from 1790 to 1850 were pretty consistent on both services. I quickly learned (although I already knew this from my regular research) that one cannot rely upon just the surname search results to generate an accurate count of individuals listed on each census. Other surnames, some totally off, get thrown into the search results as well. FamilySearch generated far more accurate surname results than Ancestry. Searching for Robledo in the 1850 Census on Ancestry generated 1,585 individuals. As you can see, some of the surnames were WAY off. The same search on FamilySearch generated only 18 individuals in the results. Still more than the 11 people I narrowed down as a likely Robledo, but far more accurate. I had to look at the individual records, and especially the individual census images, to identify real surname candidates and narrow my list down to those most likely to be Robledos. All Hispanic Names Sound Alike? I find it interesting and humorous that Ancestry identifies 3 Robledo results on the 1810 U.S. Census. These Robledo hits are actually Luceros. Hmm… is Ancestry’s indexing and search feature a bit prejudiced…thinking all Hispanic surnames are the same? I am joking of course, but Ancestry does apparently consider another three-syllable Hispanic surname ending in a hard-O sound to be a likely match to my surname. FamilySearch did not make the same mistake. Ancestry.com search results for Robledo on the 1810 U.S. Census brought up the surname Lucero. 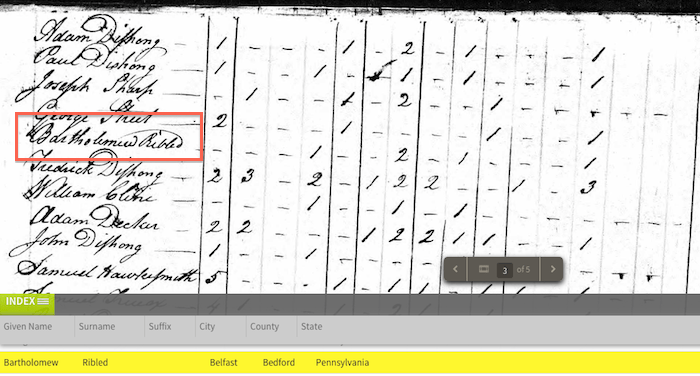 FamilySearch turned up a Bartholomew Ribled in Belfast, Bedford County, Pennsylvania when I searched for surname Robledo on the 1820 U.S. Census. Ancestry did not; I had to search for that specific Ribled name to retrieve the record in Ancestry. It sounds like it could be similar to Robledo, so I did a bit more searching for this person on other censuses. He does not pan out as a Robledo. His surname is instead spelled as Riblet, Riblett, or Ribler on other censuses. So 1850 is still indeed the first year in which any Robledo appears on the U.S. Census. Searching for Robledo on the 1820 U.S. Census in FamilySearch resulted in this similar sounding surname. Census record for Bartholomew Ribled on the 1820 U.S. Census, in Ancestry.com. Moving on to the next half of 19th century U.S. Censuses is definitely my next move. But this “quick” census analysis took much more time than I anticipated, so that next step may have to wait a month or two since it does take time away from my actual ancestor-focused family history research. The biggest challenge for me is that I want to further research all of these individuals, but I just don’t have that much extra time. So happy you took a look at your surname, did a frequency analysis and have been able to answer a few quick questions. Yes those enumerators did some interesting things AND we have to look for our surname spelled in a variety of usual and unusual ways. Hope the handout from the RootsTech presentation gave you some websites and ideas to check out. And no worries about time to work on your one-name study. I am only spending a small bit of time right now but am getting the basics down and focusing on my first region and country. It will expand as I have time. Don’t let that stop you from starting or continuing your one-name study. You are off to a great start. Thanks, Tessa. I just started a DNA project too for that surname, so we’ll see what comes up. Hello my name is Mary Rosalie Robledo I also have been searching my father is Jose Robledo I would love to find out more.